Here is a short summary of Ancient Persian Empire History. 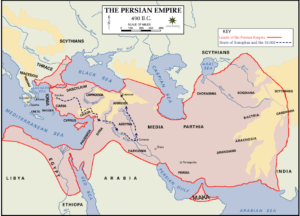 The Persian empires ruled in the middle-east until the Islamic explosion. 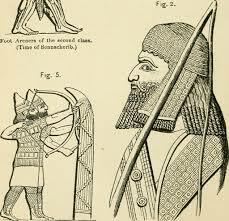 The first leader of the Persians was Hakhamanish, or Achaemenes, who lived about 681 BC. The Persians were dominated by the Medes until the accession to the Persian throne in 558 BC of Cyrus the Great, an Achaemenid. He overthrew the Median rulers, conquered the kingdom of Lydia in 546 BC and that of Babylonia in 539 BC and established the Persian Empire as the main power of the region. The Persian leader, Cyrus the Great, a religious man and adherent of Zoroastrianism, first came to power by overcoming his in-laws, the Medes (c. 550 B.C.) — the conquest made easy by many defectors. Cyrus then made peace with the Medes and cemented the alliance by creating not just Persian, but Median sub-kings with the Persian title khshathrapavan (known as satraps) to rule the provinces. In 521 BC Darius (da-RYE-us), who was a Persian and a Zoroastrian but only a distant cousin of Cyrus and Cambyses, seized the throne. The next Persian king, Xerxes (ZERK-sees), put down a big rebellion in Egypt and then attacked Greece again in 480 BC. But Xerxes was also defeated and went home. The Persians pretty much stopped trying to expand their empire then. But they continued to rule from Afghanistan toTurkey and Egypt for another 150 years until they were conquered by Alexander the Great. Although built upon the Assyrian model, the Persian administrative system was far more efficient and humane. The empire was divided into twenty provinces, or satrapies, each ruled by a governor called a strap. To check the straps, a secretary and a military official representing the “Great King, King of Kings” were installed in every province. The Documents clearly indicate distinctions of status between different members of the royal household. The titles used by the royal women are determined by the relationship between these women and the king. The non-royals and the ordinary workers are mentioned by their rank in the specific workgroup or workshops they were employed. The Persepolis tablets reveal three different terms of reference for women, Mutu, Irti, and Duksis. The first one is always applied to ordinary women while the other two were used for royal women. Families were patriarchal, polygamy and concubines existed; marriage with close relatives even brothers and sisters was practiced. Such marriages normally occur when matrilineal inheritance is an issue. This Persian empire ended with the defeat of King Darius III, at Issus, by Alexander the Great in 333 BC. 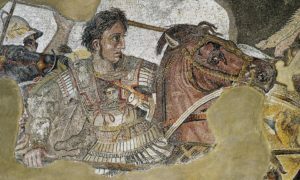 After the death of Alexander, the area was ruled by one of his Generals, Seleucus, and his successors. The last of the Sassanid kings was Yazdegerd III, during whose reign (632-651) the Arabs invaded Persia, destroyed all resistance, gradually replaced Zoroastrianism with Islam, and incorporated Persia into the caliphate.